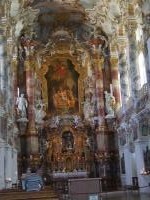 The Pilgrimage Church of Wies is considered a masterpiece of Bavarian Rococo. 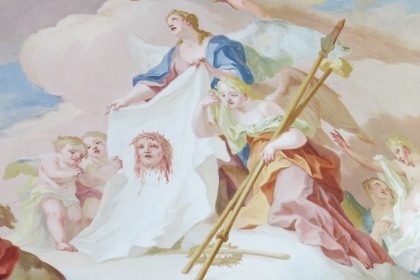 The exuberant stucco work and frescoes in lively colours were made between 1745 and 1754 by the brothers Johann Baptist und Dominikus Zimmermann. In 1738 a miracle appeared in this Alpine valley: tears were seen on a dilapidated wooden figure of the Scourged Saviour. 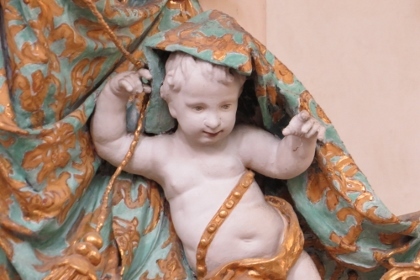 This miracle resulted in a pilgrimage rush to see the sculpture. In 1740 a small chapel was built to house the statue, but it was soon realized that the building would be too small for the number of pilgrims it attracted, and thus Steingaden Abbey decided to commission a separate shrine. Exactly one week after my visit to the Slovenian Alps, I found myself on the other side of this mountain range. It’s a long holiday weekend in Holland (and in Germany) and I used it to drive all the way to the south of Germany, to Bavaria. This church actually lies quite far from everything, even to Munich it’s still a 1.5 hours drive. But for that location it sees a remarkable number of visitors: 1.2 million pilgrims and tourists arrive here yearly. The size of the car park is testimony to that (it can hold some 20 buses), though it’s not as extreme as Mont St. Michel which has an airport size parking. The church is bigger than I thought it would be. I was expecting a small village church, but it has a fair size. It lies in a lovely setting amidst the green meadows and with the peaks of the Alps in the background. I had to wander around for an hour before I could get in: a marriage ceremony was going on. The program for that day showed another wedding, a christening and three regular church services. During all these ceremonies the interior of the church is closed to outsiders. Fortunately there’s a cafe next door to pass the time with a drink or ice cream. I also had a quick look at the old chapel which used to house the crying wooden Christ statue. At 4 p.m. I was finally allowed in. There were about 30 other visitors, although people kept coming and going so I couldn’t keep track of the actual numbers. I was expecting a lot of the decoration, but although certainly interesting I wasn’t really overwhelmed. I guess I have seen so many Latin American churches that are over-the-top exuberant that I am not easily surprised anymore. Earlier this year for example I visited the Rosary Chapel in Puebla (Mexico), where my mouth literally fell open. 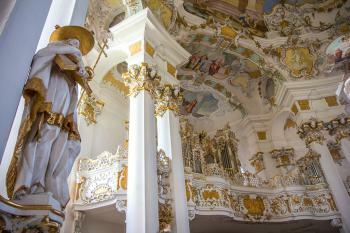 The genius of the church in Wies lies in the combination of murals and stucco work. The 4 o‘clock opening was advertised as a “guided tour”. I didn’t see any guide, but after a while someone came forward and herded us all into the church banks at the front. He introduced himself as the church’s priest, and started to tell us the story of this church and the decoration scheme. This was all done in German with a Bavarian accent, so that scared away the Asian visitors after a few minutes. But I stayed on, and his story made the decorations come alive for me. He pointed out where to look, and told about the theological meaning of the various decorative objects. All are symbolizing “Mercy”, no depiction of anything evil can be found inside. Instead of just looking at one bright chaos of ornaments, the details came forward during his speech. He spoke so long (45 minutes) that we had to leave immediately after that again as another group for a church ceremony was waiting to enter. That way I missed out on the remains of the original wooden statue, which are kept behind the altar. But it was a satisfying visit after all. Have visited this Exquisite Church in a heavenly setting twice. Both visits came on tours coming from Rome and Northern Italy. How refreshing, delightful and awesome compared to the dark and heaviness of the Italian Churches. NOT TO BE MISSED if you can get there. A great pastoral setting. Play the Beethoven Pastoral on the way to realize this fully. 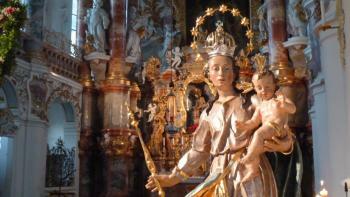 The closest main tourist town to the site is Füssen and most visitors will set out from there to visit the church. There are a lot of other interesting places to see along the way, including the famous Neuschwanstein Castle. 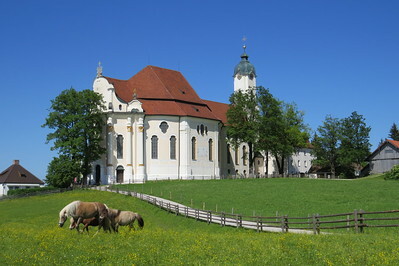 It’s easy to make a day trip around this region and include the Wieskirche as part of that. Although there’s very little around the church itself, there is an excellent restaurant right next to it serving traditional Bavarian food inside or outside. The church itself is small and only takes a few minutes to walk through. However, you should give yourself at least 30 minutes to look properly at all the frescoes and artwork decorating the interior. There are a lot of small details that take time to become obvious. I visited this WHS in June 2014. I had missed it a couple of years ago when I visited the Bavarian Alps. It is very close to a small town called Steingaden and the peaceful mountain setting and church exterior already make it a worthwhile visit. However, the OUV is definitely the over-the-top Rococo interior. Entrance is free. When I visited someone was playing the organ and this helped to create the right ambience for my visit. The initial impact upon opening the doors is one of amazement and awe at the elaborate over the top decoration inside. I've visited a fair few Central European pilgrimage churches, however I never quite have my mind calibrated to expect that the sometimes dull mayonnaise hued exteriors will hide such lustrous treats inside, and Wieskirche certainly has the biggest juxtaposition between the exterior and interior. These glorious pilgrimage churches were an integral part of the counter-reformation; the ornate over the top decoration was seen as a celebration of the glory of God and a stark contrast to the white washed protestant churches. It must have provided an astonishing presence for the people travelling for miles through the local fields. Perhaps that is why it is a now a little awkward to visit by public transport, with bus connections not really being that useful. Having said that it is very much on the tourist trail and the large car parks accommodating numerous coaches show that it is certainly well visited, making it even nicer when we had it to ourselves for a few minutes. For some reason this church has sat quite high in my mind since I first saw pictures of it, so I have been anticipating a visit for a while. 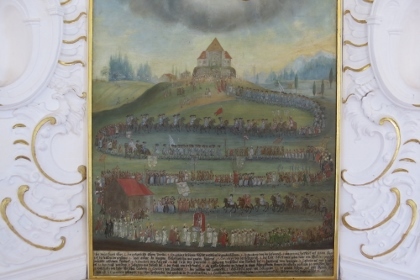 I eventually managed to head down with a good friend whilst he was working in the area, and although it was pouring with rain it proved to be an enjoyable trip, especially when twinned with a quick visit to Ludwig II's castles a little further south on the Romantic Road. Wieskirche could be a rather awkward and swift place to visit, and may not quite reward the effort put into arriving there for some, however it proved to be an easy trip for me and the flamboyant decoration certainly makes an impact. The exterior of this church, although in fine condition belies the beauty that lies within. The stark white interior is decorated with colouful paintings on the walls and ceilings. The coloured marble columns add to the spectacle with extensive gilt mouldings. I reached the village of Wies by bus #73 from Fussen station, but after the visit continued by bus #9606 to Garmisch-Partenkirchen. This is one of the sites that can be quickly visited and ticked off, but are not so easy to reach, because they are somewhat off the beaten track. Wies is just a collection of houses about 3 km from the nearest town of Steingaden. Several other attractions such as the Bavarian Royal Castles are close by, though. Having seen countless Baroque churches already, I can't say I was overly impressed by the Wies Church. It is certainly all very beautiful (at least on the inside, because on the outside it is just a normal church), but I'm not sure why this church would stand out from the many, many other Baroque churches in Central Europe alone. I suppose it was inscribed as a representative example. Fantastically beautiful church, add this to the castles of mad King Ludwig ( Neuschwanstein Castle and Schloss Linderhof) and you have a wonderful experience. And all this wrappped into the beauty and serenity of the Alps. This church though from the outside makes you wonder why you went out of your way but the moment you walk into it you are overwhelmed with how spacious and awe-inspiring it is indoors. It is wonderful. Better spend some hours to visit this place, and then spend the day in Alps instead of joining the long rows of tourists to Neuscwanstein. Neuschwanstein is wonderful as well, if not these tourists :). If you could design the interior of heaven you would use the Pilgrimage Church of Wies as your model. This small rococo church is over-the-top beautiful. When you walk in your jaw drops as wherever you look you see one ostentatious scene after another. In a word: Magnificent!